Good TV used to be an oxymoron. For many years, hour long shows were filled with situations that just didn't reflect what the viewing public wanted. Half hour shows weren't much better but at least they were funny. TV was seen as a graveyard. The place that actors went when their careers stalled. No serious director worked in this medium. Ever. Then Reality TV happened and TV seemed to reach it lowest ebb yet. Whether it was couples searching for "true" love, or people getting $100 (after taxes!) for doing gross and disgusting things, it was one bad show after another. So you had bad episodic TV, bad half-hour TV and just awful Reality TV. Then something interesting happened...Cable TV and a little HBO show called The Sopranos. Filled with real characters, violence, well written dialogue, and just about everything else that grabs viewers, The Sopranos showed that TV could be better than good, it could be art. The sea change for good television was slow in the coming, and for a good many years it was just HBO and Showtime providing this kind of content. Coming at a premium that many didn't want to pay, TV was still stuck in places like the Jersey Shore or with characters like My Antonio. The turning point was with a show called Breaking Bad. This "little" show about a nebbish character named Walter White took everybody by surprise. The plot was perfectly simple. Facing money problems and a recent diagnosis of cancer, White, a chemistry teacher, starts up a drug trade that made him the biggest meth dealer in the US and beyond. This show captivated viewers and woke the bean counters up to the fact that viewers actually wanted to see good TV. As we move into the fall phase of 2015's television line-up, TV watchers can rejoice in just how good television has become. Whether you are watching cable, regular TV, or even internet programming, there is something for everybody now. Name actors and directors are abandoning the big screen for the small one. Making this even more exciting, is that this programming is actually good. It's enough to get one extremely pumped, which is why we have prepared "The 11 Most Promising TV Shows of the 2015 Fall Season." Things are so good, we thought you could use a list to help guide some of your viewing choices. Melissa Benoist plays the iconic role of Supergirl in this TV show that already seems to be levels above the movie from 1984. With a cast that features such iconic 1990s names as Dean Cain and Calista Flockhart, this show appears to be firmly rooted in the present while tipping its hat to the past. With deep pockets behind it, this superhero adaptation also seems to be benefitting from todays golden age of Superhero movies. Also helping this show is how well Melissa Benoist seems to straddle the worlds of Supergirl/Kara Danvers/Linda Danvers. In a day and age where everybody wants to create a brand, Supergirl has anticipating how it is going to BE. Supergirl premieres Monday, October 26th on CBS before moving to Thursdays later in the fall. What's not to like about a show featuring a sorority and a homicidal maniac? The two seem to have gone hand in hand ever since Roger Corman made them hip in the exploitation realm years ago. This show centers on the 20 year "celebration" of a sorority pledge that had dire consequences. And, as you guessed it, scary things start happening in the present that are eerily similar to the past. With a solid cast featuring Emma Roberts, Abigail Breslin, Ariana Grande and the Scream Queen herself, Jamie Lee Curtis, Scream Queensseems more like an event than a TV show. Something tells us that despite a killers wishes, this show, and these characters will keep going. Scream Queens debuts September 22 on Fox. Making a TV show out of a surprise hit movie can be a dicey proposition. However, the concept of Limitless is so rich, so open for story development that we think this show will deliver. The movie followed a man (Bradley Cooper) who took a pill that allowed him to access all of his brainpower. The TV show continues this but in a serialized format. By taking this concept and making a show, one can only imagine where there are going to take things. What will they have this character do? Will things wrap up nicely at the season finale or will we be left waiting in pain by a cliffhanger? Also, this show features the return of Dexter's Jennifer Carpenter and who isn't excited about that? In this day and age of disposable media, Limitless is another example of just how good good TV can be. Limitless premieres September 22 on CBS. With the 2011 movie doing $165 million worldwide, why not bring back the famous TV show from yesteryear. Making this even better? Gone is the variety show format it seems (not that that was bad), and it's been switched out for a 2015, Reality TV-type show. As we already mentioned, Reality TV is on the wane and what better way to send it up than to "Muppetize" it? Who doesn't want to know more about the personal lives of Kermit and Miss Piggy? Who doesn't want to see Fozzie and Animal behind the scenes? With actors such as Topher Grace and Elizabeth Banks involved in this, how can The Muppets not be a show on the "must see TV" list? 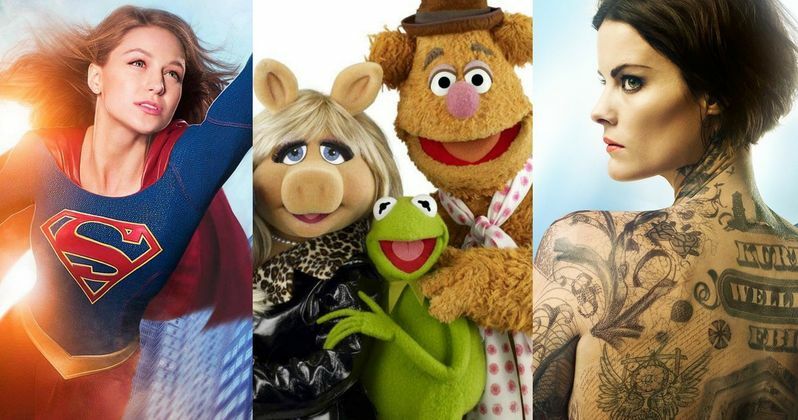 Everything old is new again but, with The Muppets, it seems like everything old gets better when it's reinvented. The Muppets premieres September 22 on ABC.